The TL40 (TL65) emergency control unit provides 50% light output for one hour using either a 36 Watt or 40 Watt (58 Watt or 65 Watt) fluorescent lamp. The unit complies with SABS 1464 Part 22 and therefore provides all necessary battery charging, low voltage cut-off, protection and performance criteria. A battery pack of 5 x 4 Ahr (8 x 4 Ahr) nickel-cadmium cells is required. The unit provides an output of 20 Watts (30 Watts) and could therefore be factory set to drive other lamps. For example: 100% emergency light output could be provided using a 20 Watt (30 Watt) fluorescent lamp. The light output may vary depending upon lamp type, ambient temperature, mains voltage and ballast, and so the light output must be measured to ensure compliance to SABS 1464 Part 22. A 10% variation must also be allowed for production spread in control units. Either maintained or non-maintained mode can be used. A safety start circuit is provided that prevents emergency operation until mains is connected. This enables installation without disconnecting or depleting the batteries. A red pilot light indicates that the batteries are being charged. The case material has excellent high heat resistance and impact strength properties and includes a wiring connection diagram. 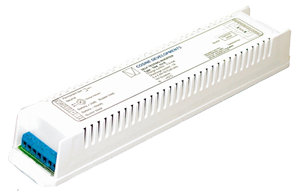 The TL40_1/E and TL65_1/E can be used with any ballast type (switch start, electronic control gear or dimming circuits) to provide 50% light output with either a 36 Watt or 58 Watt lamp. The unit incorporates a ballast switching relay to ensure proper lamp re-ignition in instances where only the permanent mains supply is interrupted to test the emergency lighting system. Note 1: Any version can be ordered with a standby switch option. This feature enables the emergency light function to be inhibited during a power failure thereby conserving battery energy. The standby switch cable must be no longer than two meters. Note 2: Any version can be ordered in an explosion proof, potted housing (Zone 1 / 2 fitting).